Includes table and four counter height stools. Perfect for family meals or game nights, this chic marble and blue 5 piece counter height dining set from RC Willey will instantly up your dining room game and will provide an ideal place to gather with those you love. The soft blue velvet counter height stools pair beautifully with the marble and black table giving this inviting set an air of class and sophistication. 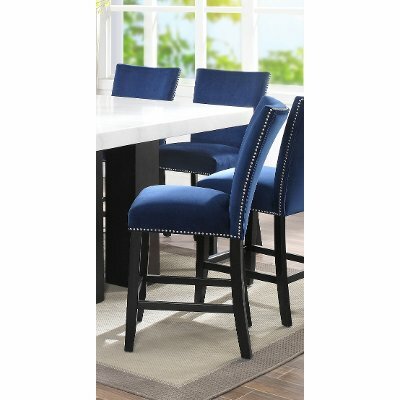 Get ready to fall in love with this sophisticated and soft blue velvet upholstered counter height stool from RC Willey. With its sturdy and sleek black legs and classy nailhead trim, these chairs will wow in every way and will look stunning in your home.